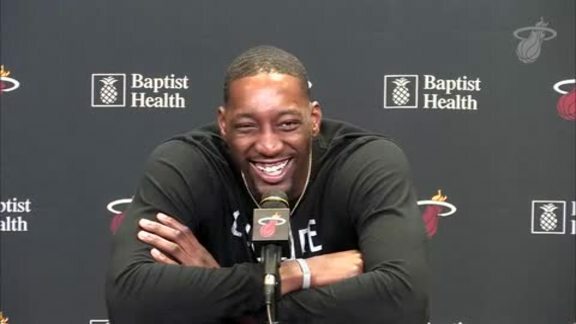 As his second Summer League began in Sacramento, Bam Adebayo sat down with HEAT.com to catch up on a variety of topics. Couper Moorhead: We’re in Summer League 2.0 for you now. Last year you seemed to have the usual wide-eyed rookie approach to it. What’s different this time around? Coach wants me to be more aggressive, more assertive. Pretty much like the team captain, and the second coach on the floor. Expectations are very high, higher than last year. I’m just trying to embrace that role. Is that something that comes naturally to you, that leadership position? It gets me out of my comfort zone. Sometimes I don’t feel comfortable trying to tell somebody else what to do. They want me to take that role upon myself. They want me to be like the UD of the group. I’m just trying to do that for my team to help them win. You’ve been around UD for a year now, you’ve seen him do it, so what do you have to do in order to be that? When you have games without UD, you can tell. That’s that one voice that, other than Spo and the coaching staff, we listen to. Yeah. He’s basically the glue guy to our team. Which leads us a bit into the next question. Now that you’ve been in the league, you’ve got all the surprise out of the way. What do you want to be? What do you want to make yourself into? They want me to move forward into the positionless basketball, which I wanted to do my whole life. You just have to make sacrifices on some other teams. But they want me to take that push and be positionless, so that’s what I’m trying to move myself towards. Trying to add that coaching aspect to it, being that second coach on the floor like I mentioned, trying to get guys into their spots, but also not stepping on guy’s toes to the point that they think I’m trying to police them. We’ve spoken about being positionless before, about what that means to a skillset and all the different types of places you have to defend. But part of it, as you’re alluding to, is thinking the game from all those different spots and situations. Is that harder than we might think it is? Yeah, it definitely is. If you think about it you have to know 1-through-5. Every spot on offense. You have to know what to do in different spots on defense. It really increases your IQ, but it’s a challenge and I’m looking forward to taking it on. It also means knowing the other team’s playbooks? Yes, for sure. That’s like Rajon Rondo. Him and DeAndre Jordan, I feel like they are the two best in the league that do it, that know everybody’s plays. Playing against DeAndre Jordan, he was calling out plays. We would call it something else but he knew what the play was. Just to hear him blow up our play, it’s mind boggling. So I’m just trying to look forward to doing that. Seems like Rondo has that reputation around the league, but not so much Jordan. Why do you think that is? If you play against him, you’ll hear it. I guarantee you, you’ll hear it. We’ve heard the player comparisons already. Pat famously mentioned Shawn Kemp once upon a time. I’ve heard Draymond. All guys with some similarities. With a season of experience now, is there anyone you’re modeling yourself after? I always wanted to play like KG [Kevin Garnett]. Just growing up watching him, his attitude, his mentality, his aggression, his skillset – just watching that, he never gave up on plays, he was the loudest on the court, he didn’t care who was in front of him. I’m just trying to build myself to be like him. Was it 2004, when Minnesota made the Conference Finals and KG was essentially playing point guard? Now with yourself getting into the Point Bam thing a little bit, do you think about KG managing the offense at the top of the floor? I do. But then also on the defensive end, you heard him. He was the first one down the court back on defense, first one talking. Directing traffic. Help side [defense]. He did it all to help his team win. We’ve seen a little bit of you with Rasheed Wallace lately. I grew up watching him in Portland and he was one of my favorite guys, but he never seemed like he got the respect of someone of his talent level. I think people focused on his attitude more than his actual, pure talent. Sheed still hoops now. It’s still incredible to witness him moving now that he’s out of the league and retired. Just seeing him doing all the things he was doing in the NBA. I tell him every day he’s a scary dude. Just mixing those two together, looking after KG, working out with Rasheed. The sky is the limit if you put forth the effort. Most of the clips we saw of you two, you were working on moves. Did you ever get a chance to really defend him, considering he had one of the most unblockable shots ever? He’s a great guy, great personality. Some people will say because of his attitude on the court, they give him a certain description off the court. But if you actually meet and sit down with Sheed and actually talk to him, he’s a fun guy, loves to have fun and loves to work. Talks a lot too. [laughter]. Did you ever get a word in? B: I did, but that’s just how he is. He’s the teacher, I’m the student. I prefer him to do more talking. Speaking of those touch shots Rasheed had, those 3-to-10 foot shots seem to be a bit of a focus for you right now. What’s the key to making those shots high efficiency? Time. Just taking time, being in the gym with 17 [Juwan Howard] every day and working on it. Hours and hours and hours. Just trying to perfect your craft and perfect that shot. In Kobe’s words, like he said, he would walk into a gym and work on a move for three hours until he mastered it. I’m trying to do the same thing. Let’s just say hypothetically you could wave a magic wand and become a master at any part of your game, what would it be? I would say Kyrie’s handle. Yes. For sure, for sure Kyrie’s handle. Oh my god. That is a gift. Do I get to keep going? Go for it. Frankenstein yourself into a perfect player. I’m taking Kyrie’s handle. Rajon Rondo’s IQ. LeBron James’ body. Derrick Rose in-his-prime bounce. Klay Thompson’s shot. Actually, matter of fact, Damian Lillard. Lillard is good at running off screens, off the dribble, off the catch. Him and Steph Curry. And then, after that . . . [thinking] . . .
Got a lot covered there. Oh, Hakeem the Dream’s footwork. And DeMar DeRozan’s mid-range game. You would probably be making the Hall of Fame at that point. Oh my god, [laughs], you would be destroying. Getting off the court a little bit, you’re active on social media but not to the same point of other players like JRich where we always know what you’re doing. So when you’re not working, what do you like to do? Honestly I sit in the room and play Fortnite. We pretty much play Fortnite until our eyes bleed. What do you like about that game so much? It’s just a challenging game. I’ve seen the building aspect of it and it’s tough to wrap your mind around. It takes a while to get a hang of. 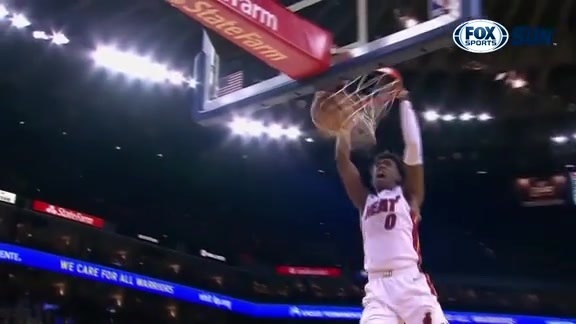 Me and [my friend] will get on, then [Josh Richardson and Jordan Mickey] will get on. So we’ll all be playing. When I’m on road trips, we’ll all bring our Xbox. Then we had to get Justise [Winslow] on the wave but Justise would never go buy an Xbox. He didn’t even have a PS4. Shoot. I don’t know about Justise [mock indignation]. When we got [to our destination] we would all play. After shootaround we would play a little bit, then take a nap. We just kept a routine. Did you guys win much? B: Pshh, no. It takes four for a squad. 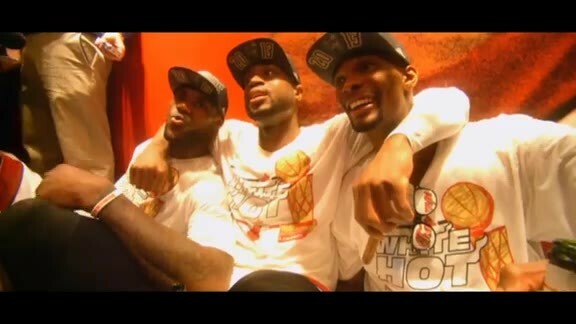 It would just be me, JRich and JMick, so we would have to pick up a random. We would be 4-on-3 because the random would go the total opposite way. Naturally. You also had your mom move down to Miami with you. What has that been like, having her nearby? Home-cooked meals every once in a while, but it’s great just to see her happy. Just seeing her feeling free, not having to worry about anything, bills or anything, being stress free. Coming to every game with a smile on her face. She worked so hard, and now it’s time for her to relax. She’s done a couple interviews with the team and is obviously incredibly proud of you. Are you also proud of yourself that you’ve been able to give her a different life. Yeah. She went through a lot. She grew up fast and worked [for every cent]. Now she’s kicking back and enjoying herself now. What do you have planned for later this summer? She wants to go to [Universal and Disney], so I’m going to take her.